Pfister is a well-known brand, so, of course, we had to offer Pfister faucet reviews. We picked Pfister’s top four faucets for our review selection, and have compiled them here for ease of comparison. We hope you find our reviews helpful in your quest of learning about and comparing Pfister faucets. Why Pfister? Pfister is yet another company with an excellent track record within the faucet industry, and their faucets typically have something of an industrial look about them which is not a bad thing whatsoever. This is a look that appeals to many and with their slightly more chunky specifications and solid build, they often suit many modern kitchens where performance is placed overlooks and aesthetics. They are also some of the cheaper faucets available and with their reliability and range of classic finishes, which is not a bad thing. The Pfister Cagney with soap dispenser is a great pull down faucet , and the coordinating soap dispenser is both beautiful and convenient. As seen in the features, the Pfister Cagney has a broad variety of options for installation. 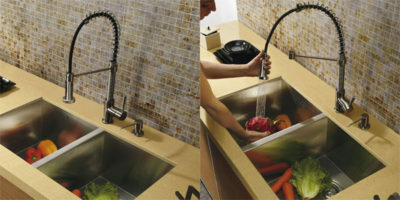 It can be installed where there are one, two, the, or four holes, which allows this faucet to fit into any kitchen. It also fits in well with a variety of designs with its beautiful hi arc and matching deck plate. This model also includes a soap dispenser that matches the faucet perfectly. 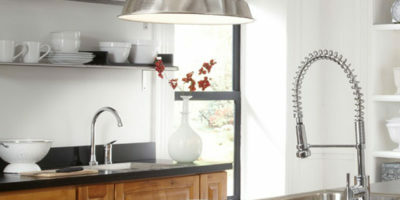 The faucet makes cleaning or filling even large pots quite easy with its extended reach and large clearance. The sprayer has a spray and stream setting with buttons located on the back of the spray nozzle for ease of use. The soap dispenser can be filled with hand soap, dish soap, lotion, or whatever you choose (like heavy duty hand cleaner if you have a mechanic in the house). It refills from the top, saving you from having to crawl under your sink each and every time you run out of soap (or whatever you choose to fill it with). A few customers complained that the weight on the hose was not enough to retract it fully. To compensate, some purchased an additional weight to add to the hose near where the manufacturer provided one is installed. Others reported that is instructions are followed and the sink is installed according to the instructions, the faucet retracts exactly as it is supposed to. There was also a problem reported with the soap dispenser leaking under the sink. If customer service is called about this issue, they are reported to ship out a new dispenser quickly and without hassle. Another complaint about this faucet is that although labeled for installation in a variety of setups, for three- hole installation, it is actually quite tricky to figure out the install. You have two options here: use the deck plate to cover the empty holes, and forgo the soap dispenser, or install the faucet and the soap dispenser without the deck plate and purchase an additional stopper to cover the third hole. Another complaint made about this faucet is that the locking mechanism on the spout is quite a hassle to use. Apparently, it is very hard to get this mechanism to lock into place, and users feel that because it is so hard to use, it is more likely to wear out with time. 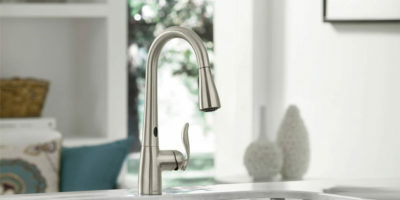 Whereas looks were not that much of a priority on the previously reviewed faucet, on this particular one they are integral to the design and function. Featuring a somewhat bulkier spray head than what you may be used to, this actually plays right into your hands as a user as the spray function is one of the most all-encompassing and best cleaning spray heads we have tested. The stream is also incredibly powerful and filled containers incredibly quickly as a result. The flow rate of some 2.2gpm it is felt contributed massively to this factor. Being of a larger size also makes it incredibly easy to clean which is never a bad thing. One of the other most beneficial features is the switch that switches between modes. It is fast, responsive and generally performed well above its closest competitors. Coming with one handle that is incredibly accurate at changing flow volume and temperature of the water at hand, this is an incredibly practical faucet and it even installs in both two and four hole installation plugs, which makes it practical for a wide range of kitchens. Reliability is also good thanks to the brass base of the unit and the ceramic no-drip valve installed in the faucet head. Currently less than $250USD, the price makes this an excellent option for purchase if you are in the market. Here is the full review of the pull-out version of this faucet. 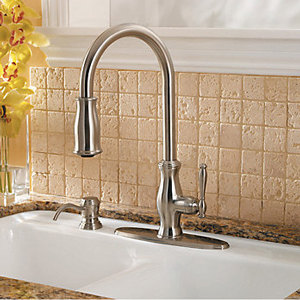 The Pfister Avanti is a durable and functional pull-down faucet that boasts many cool features. 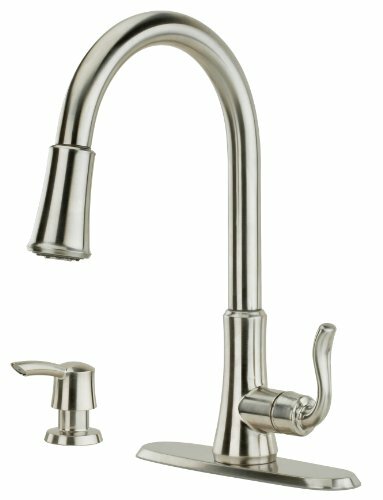 The Pfister Avanti one handle pull-down kitchen faucet features all-metal construction. It has a high and graceful arc that is described as stunning and is also very heavy and sturdy. It comes with a socket tool for installation and is designed to be easy to install. The pull-down sprayer has two functions; spray and stream. The stream is described as full and strong and the spray is powerful for blasting gunk off of dishes. The pull-down sprayer hose has a large reach that consumers find very convenient when trying to spray the outer edges of their sink or even fill up containers outside of the sink. It is very easy to use and the toggle button on the sprayer is very well placed and ergonomic. Consumers also reported that the pressure for this sink is higher than expected for the amount of distance the water has to travel through the hose. There are complaints with this faucet having a fray in the nylon house after about a year’s worth of use. The hose is covered under the limited lifetime warranty. It should also be noted that the quick connect, which is designed for ease of installation, does not disconnect as easily. If you need to make repairs, this may prove to be an issue. Also, it was reported that customer service wasn’t the easiest to deal with but they did end up sending required parts. Another complaint is that the arc of the faucet places the spout far back and it leads to splashing and having to bend over and reach to get hands under the faucet for washing. Some users pull out the faucet just a little with the angle forward towards the front of the sink. This does detract from the beauty of the faucet but makes it more user-friendly. Another complaint is that the hose for the pull-out sprayer is very long and can be a nuisance if you have limited space under your sink due to a garbage disposal or other mechanism such as an under- the- sink water filter. It may even brush against pipes or become tangled with them. Some solutions are to tape a garbage bag around the hose to contain it away from other obstructions or even to simply remove the weight and manually retract the pull-down feature to avoid the weight brushing components. If a water filter is to blame, you could consider a new water filter. Pfister, originally Price Pfister, was founded in 1910 by Emil Price and William Pfister. Their first product was actually a garden faucet, but within 10 years, they expanded their product line to include bathroom and kitchen faucets, along with other miscellaneous plumbing products such as valves and hose nozzles. In those 10 years, they also introduced their Adjustable Swing Spout that included a convenient soap dish. This was clearly the precursor to the Pfister Cagney one handle pull-down kitchen faucet with soap dispenser. Over the next 10 years, Pfister continued to produce quality innovative products. In the early 1940s, they took a break from producing their usual products to back the war effort, as many US companies did during World War II. In the 1950s, the Crown Jewel line was released, making Price Pfister a household name. The 1950s focused on creating a kitchen workspace that was efficient, easy to use, and that made meal prep a fast and pain-free experience. The Crown Jewel line was designed to be easy to install and more functional and durable than the products offered by the competition. This translated well into what was expected of a kitchen in the 1950s, creating widespread popularity for the brand. In the 1960s, the single control handle was designed, called the Flow-Matic shower handle. In the 1970s, when the focus was largely on design, Price Pfister released a number of new finishes, along with translucent colored handles that were popular in the 1970s. In 1985, the slogan “Pfabulous Pfaucet with the Pfunny Name” was released. The slogan was used in a series of TV commercials released that year. In 1990, Price Pfister became the first company to offer affordable pull- out faucets in the retail market. In the next decade, they released the Pforever Seal, Pforever Pfinish, the industry’s first integrated filter, and the first limited lifetime warranty, which is still applicable today. Since then, with the technology boom, this company has made leaps in faucet manufacturing, bringing them to where they are today. Pfister is a well-known brand with excellent customer service that stays on the cutting edge of technology, producing quality easy to install faucets. Out of Pfister’s most popular faucets, we have reviewed the top four here. For other top faucets, see Faucet Mag’s top pick faucets. Sonoma is a very functional pull out faucet that is probably the best option for those who want performance comparable to an industrial style faucet with a tight budget. The Avanti clocks in as second most affordable, with its all-metal construction and overall great functionality. For those who like the hideaway soap/ lotion dispenser, there is the Cagney or the Hanover, both of which offer a range of installation options. 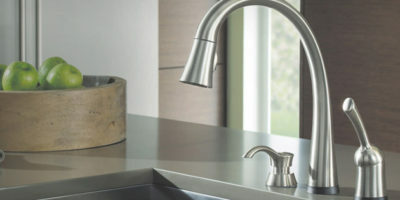 All of Pfister’s faucets are available to order online for a great price and fast shipping. Overall, Pfister has many quality products to offer, and we hope our Pfister faucet reviews give you a head start when shopping for this brand. The Price Pfister warranty is absolutely worthless. I called them two weeks ago for a replacement on the for a 0X9/JX9 Series Brass Tub & Shower Valve, stem, handle, and Trim kit Case. I included pictures of all the parts and explained that when I took the handle off the stem screw, handle, and stem broke off and that I needed a complete kit including the valve. I waited a week and nothing had arrived so I called and they looked up my Case #201609679053 and found that the order had been sitting in a tray in shipping for over a week. They apologized and promised to get the item shipped same day. 4 days later I received only the handle and trim kit with no valve plus the handle and trim kit were the wrong parts. My wife and I live in a small cabin with only 1 shower. We have not had a bath or shower for two weeks and I am still waiting for them to answer the phone after being on hold for over an hour. That is par for the course – each time I have called I have been put on hold for up to 2 hours. I might note that I also had a leaking MOEN kitchen faucet which was received within 24 hours of my request for a warranty replacement. Needless to say, at this point I am considering replacing the unit with a MOEN faucet and file a lawsuit in small claims court for the cost. Informative feedback, we will consider this in our next review!